Click here for teddy's rear view. When your time comes to return to ashes, you could be scattered, or you could simply be kept on a shelf in a big urn. But why not consider a third option? Being stuffed into a teddy. Huggable urns make your remains cuddly. 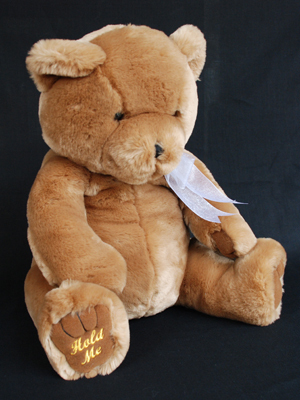 The lovingly crafted bears are stitched with the words "Hold me", and hold you they will. "All of our Huggable Urns come with a soft velvet pouch for storing the ashes. The pouches are lined with plastic and have a tight velcro closure to keep the ashes contained," says Huggable Urns HQ. The Paddingtonization of death will set you back $99.95, or $149.95 if you want your furry memorial to come with angel wings.